Hello, everyone! International Indian Film Academy (IIFA) Awards was held in Madrid, Spain this year and our very own gorgeous Bollywood stars walked the green carpet with the flawless attire and gorgeous makeup looks. While some of the celebrities looked stunning and gave us some serious fashion and makeup goals, there were others who failed to impress us. Let us see the celebrities who walked the green carpet of IIFA 2016. This woman has an amazing charm and she manages to make everything look so good and flawless. From the makeup to the gorgeous dress – Deepika Padukone is the true diva in every right. For the green carpet look, she wore a white Sabyasachi Mukherjee gown and also sported a godet skirt and cape which has been apparently inspired by Spanish bull fighters. The dewy makeup game was strong and that mesmerizing smoky eyes with MLBB pink lip color screamed perfection. The hair was in a sleek middle-parted ponytail. The hair and makeup were done by Daniel Bauer. She is typically known for her badly dressing sense in events and has often attracted the fashion police but this time, when I saw her look on Instagram, I was in awe. She looked like a pretty princess in the white lacy floral Abu Jani-Sandeep Khosla outfit. I adored the delicate ornamental work of the outfit. She did a fresh satin-dewy makeup along with a dark winged liner and burgundy lips. Her hair was sleek side parted and did a small bun in the back. She was styled by Alia Al Rufai. Shilpa Shetty wore Shantanu & Nikhil white cut out mermaid gown with mesh detailing and gold border. It was sheer perfection the way she showed off her perfectly crafted body with tanned glossy skin. The golden ear cuff and glossed flown hair along with her makeup looked amazing on her. 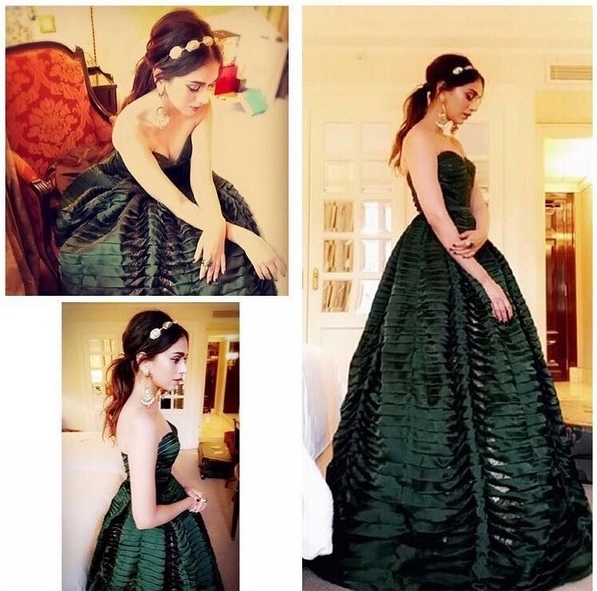 Aditi Rao Hydari donned a Grecian Goddess look in her emerald green gown by Shantanu & Nikhil along with the Outhouse headband which was impeccable. The earrings were also very pretty and complimented her look very well. Her makeup, which was done by Elton J Fernandez, was soft, delicate and was beautifully carried by her. Bipasha Basu wore a deep navy Abu Jani and Sandeep Khosla gown. The color suited her very well. The frills and flared lower half was very pretty. The hair was done in a puff and messy bun sort of look and the makeup was minimal. Although, the makeup could have been a bit better. Her beauty has a freshness to it. She wore a mint Nakul Sen gown along with Hajoomal jewelry and her makeup was done by Theia Tekchandaney. In my opinion, the dress and makeup were okay but she could have given a bit more effort and brought some glamor and pomp. Shriya Saran wore a maroon gown by Falguni Peacock which showed her curves pretty well. She went for a sleek middle parting low ponytail along with smoky eyes and glossy MLBB lip color. She wore a simple stud for the earrings and I believe a bracelet would have added a bit glamor to the look. Neha Dhupia sported two white separates, a white shirt and a glossy flared skirt from H&M. She was styled by Sohaya. Neither the dress was suitable for a special event green carpet nor the makeup. She was not impressive in the outfit at all. 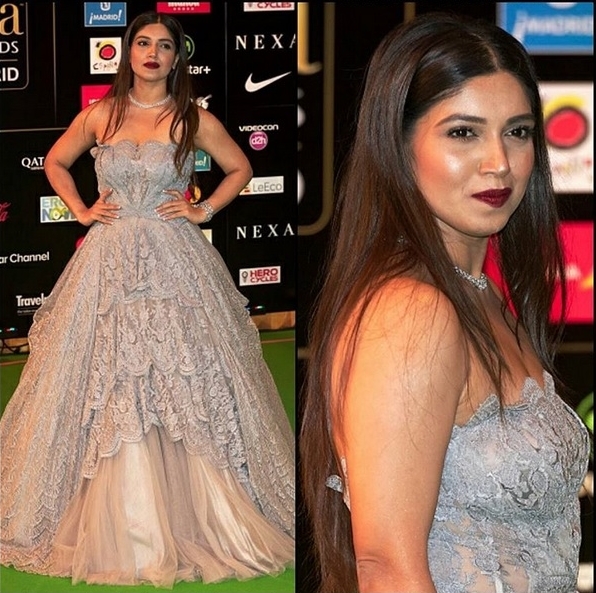 Bhumi Pednekar was wearing an off-shoulder gown, by designer duo Shantanu and Nikhil. Her hair was poker straight, middle-parted and open. The makeup was slightly glossy along with simple kohl eyes and vampy maroon lips. Her makeup was done by Neeraj Navare. She has graciously shown off her curves and I love the way she has carried off the whole attire. Nargis Fakhri wore a pastel blue perfectly tailored suit with golden bling near the cuffs, designed by Monisha Jaising. She paired this up with beige heels and sleek side parted low ponytail. Her makeup was immaculate soft brown eye makeup and glossy peach-brown pout. Her chiseled face, sharp nose, and pout were irresistible. Whose look did you like the best? Do share your views! OMG.. i wish i could own all of them..specially the emerald green gown of aditi rao hydari..its so pretty. Deepika looks like a greek goddess. Thanks Sonia, I so agree with you. You know, whatever she wears, she carries it with such grace..that's impossible to describe!